You are invited to the poetry reading "BRIKCIUSOVÁ NA PRÁDLE - OPILÁ PLACHTIVICE" from Anna Brikciusová's new poetry collection, read by Jan Židlický with accompanying music by the author, scheduled for Sunday 16th November 2014 at 6pm, at the Church of St. Jan Křtitel Na Prádle (Říční 6, Praha 1), as part of the 16th Festival Poetry Day, the 204th anniversary of the birth of poet Karel Hynek Mácha, the 3rd Festival Brikcius, the Year of Czech Music and Daniel Pearl World Music Days. Free entry. The main purpose of the annual Poetry Day Festival, held on the anniversary of Macha's birth (16th November 1810), is to raise awareness of poetry. 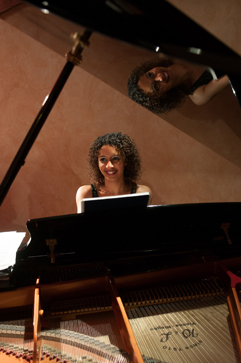 The event will also premiere a new composition "La nuit est tombée" by organist and composer Irena Kosíková. The next concert DUO BRIKCIUS & YEAR OF CZECH MUSIC (Duo Brikcius: Anna Brikciusová - Cello & František Brikcius - Cello) will take place on Thursday 20th November 2014. For further information, visit http://Festival.Brikcius.com and http://www.DenPoezie.cz . What anniversary reminds the poetry reading Brikciusová Na Prádle - Opilá Plachtivice? Contest is over, lucky winner is D. P. from Praha 8. Prize for the CZECH CELLIST FRANTIŠEK BRIKCIUS NEWSLETTER is provided by the "Festival Brikcius". Our roastery Laura coffee is located in Krmelín, which is small village near Ostrava and we are running a café and a coffee education center right in Ostrava within Viva the co-working center. We try to offer something more than just "coffee" to our clients. We are simply enjoying the coffee. After all the roastery is named after the owner's older daughter - Laura. The younger one - Valentina - has at least an espresso bland named after her. We care a great deal about the quality of coffee and environment. But we don't want the form to exceed the content (we are not showing off with the coffee certificates). The most important thing for us is coffee as ingredient. We buy green coffee from current harvests, if possible, with cupping score from 80 and higher (e.g. speciality coffee). We roast the coffee so it is as fresh as possible for our clients, we recommend to consume our coffee for two months after roasting and the expiration date is six moths after roasting. We are offering something new and fresh to our clients. Coffee should touch all of our senses, it should look beautifully, smell beautifully and taste beautifully. 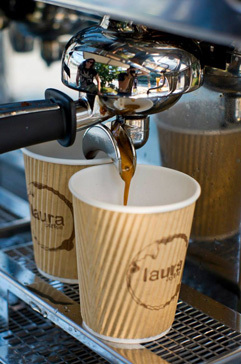 More details about the Laura coffee, the official coffee of the Festival Brikcius, on websites http://www.LauraCoffee.cz and https://www.facebook.com/KavarnaLauraCoffee . Czech composer Bohuslav Martinů was born on 8th December 1890 in Polička. His father Ferdinand, a shoemaker, served as fire watchman, and the family lived in the tower of the St. Jacob Church. He studied violin, piano and organ at the Prague Conservatory from 1906, but he was expelled in 1910 for "incorrigible negligence". He works as a composer, first consultations with Josef Suk (1874 - 1935). The First World War breaks out in 1914, Martinů is excused from obligatory military service. He begins playing occasionally as an auxiliary violinist in the Czech Philharmonic. In the summer 1916 he returns to Polička teaching violin. As World War I drew to a close, and Czechoslovakia declared an independent republic, Martinů composed a celebratory cantata Česká rapsodie ("Czech Rhapsody"), which was premiered by the Czech Philharmonic in 1919 to great acclaim. As a violinist, he toured Europe with the National Theatre Orchestra, and became a full member of the Czech Philharmonic Orchestra in 1920 (playing second violin, third stand), when he moved back to Prague. He also began formal composition study under Josef Suk for one year (before his departure to France). Martinů departed for Paris in 1923 to study composition with Albert Roussel (1869 - 1937) having received a small scholarship from the Ministry of Education. He lives in Paris, usually spending the summer months in Polička. In 1926, Martinů met Charlotte Quennehen (1894 - 1978), a French seamstress, and they married in 1931. Martinů is elected a regular member of the Czech Academy of Sciences and Arts and he is published by Leduc. He receives the First Prize from the Elisabeth Sprague Coolidge Foundation in Washington (1932), the Smetana Prize (1933), the Czechoslovak State Prize (1935). In 1937 Martinů meets the Czech composer and conductor Vítězslava Kaprálová (1915 - 1940), but she in 1939 married Jiří Mucha (1915 - 1991). 1938 first commission for Swiss conductor and maecenas Paul Sacher (1906 - 1999). When the German army approached Paris early in the Second World War, Martinů emigrates via southern France, Spain, and Portugal, having been blacklisted for his connections to the Czech resistance by Gestapo. Finally, he and Charlotte, eventually reached the United States in 1941 with the help of many friends and they settled in New York. In following years he compose his six symphonies, which were performed by all the major US orchestras. In 1943 he composed Memorial to Lidice in remembrance of the village of Lidice that was destroyed by the Nazis in reprisal for the assassination of Reinhard Heydrich in the late spring of 1942. Learns of the death in March 1944 of his mother and follows in shock the political trial of Václav Talich (1883 - 1961). Since 1946 Martinů teaches at the Berkshire Music School, where he suffers a severe injury whose consequences he will feel for the rest of his life. After the tragic death of Jan Masaryk (1886 - 1948) he abandons the idea of returning to Czechoslovakia and remains in exile. He was named a professor of composition at Princeton University in New Jersey (1948 - 1951), he taught at Mannes College of Music for most of the period from 1948 to 1956. In 1952 he gains American citizenship. A year later receives a year's fellowship from the Guggenheim Foundation, leaves the USA, and settles with Charlotte in Nice. From this point on he will live mainly in France, Italy, and Switzerland. He is elected as a member of the National Institute of Arts and Letters (1955), shortly teaching at the Curtis Institute in Philadelphia and again at the Mannes School of Music in New York until returning to Europe for good in May 1956, when he took up an appointment as composer in residence at the American Academy in Rome. In 1957 again received fellowship from the Guggenheim Foundation. Paul and Maja Sacher invited him to Schönenberg near Basel, and he and Charlotte moved there permanently in September. In November 1958 his first major health crisis, leading to a stomach operation. 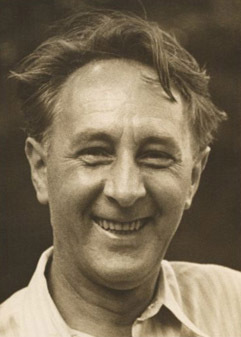 Bohuslav Martinů died at a clinic in Liestal, Switzerland, on 28th August 1959. Bohuslav Martinů was buried, as he had wished, in Schönenberg, the estate of Swiss conductor and patron of the arts Paul Sacher. Twenty years late his remains were moved to Polička, where he was born. His notable students include Alan Hovhaness (1911 - 2000), Herbert Owen Reed (1910 - 2014), Jan Novák (1921 - 1984), Vítězslava Kaprálová (1915 - 1940), Howard Shanet (1918 - 2006), Chou Wen-chung (*1923) and Burt Bacharach (*1928). In 1975 his wife Charlotte founded the Společnost Bohuslava Martinů (Bohuslav Martinů Society). Also in 1977, she transferred rights to performance and publication of her husband's works to the newly-founded Nadace Bohuslava Martinů (Bohuslav Martinů Foundation) in Prague, and partly also to the Bohuslav Martinů Stiftung in Basel. The 55th anniversary of the death of Bohuslav Martinů is commemorated by the Festival Brikcius - the 3rd chamber music concert series at the Stone Bell House & the Year of Czech Music 2014. 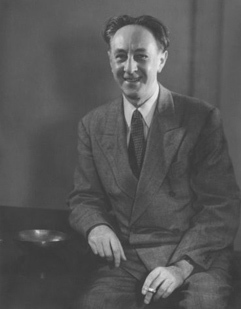 For more details about Czech composer Bohuslav Martinů visit websites http://www.Brikcius.com , http://www.Martinu.cz and http://EN.Wikipedia.org/Wiki/Bohuslav_Martinů . Get a free ticket for the poetry reading "BRIKCIUSOVÁ NA PRÁDLE - OPILÁ PLACHTIVICE", held on Sunday 16th November 2014 at 6pm, at the Church of St. Jan Křtitel Na Prádle (Říční 6, Praha 1, Czech republic). Free ticket for this event is available via official "Festival Brikcius" advanced ticket sales Ticketon.cz .